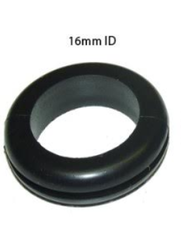 Our range of products include rubber grommet, grommet, epdm grommet and rubber caps. We are dedicatedly engaged in providing a large assortment of Rubber Grommet that is broadly utilized in RO water plants. Due to the smooth surface and fine finishing, these products are highly used. Apart from this, these products are offered to the clients at very reasonable prices. Also, we offer these products in a variety of sizes as per the requirements and made from high-quality rubber. 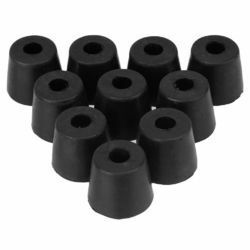 Backed with a team of experienced professionals, we are engaged in offering our clients with an extensive collection of Rubber Grommet. This grommet is manufactured in compliance with the international quality standards using premium grade rubber and latest technology. Available in different specifications to meet specific demand of clients, this grommet is precisely checked on diverse quality parameters. This grommet is offered at the most affordable rates to the clients. 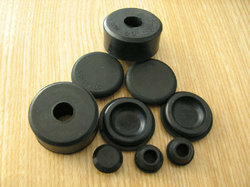 Rubber grommets and bushings are used to protect or cover through holes with rough edges. The installation of grommets can eliminate sharp edges to protect wires, cables, or hoses from damage. Electrical wires, cord, rope, lacings, or other soft material passing through a hole with rough edges can cause abrasion and failure. The rubber grommet can shield the wire or other material from any damage. The rubber grommet also adds a neat, clean look to any professional wire or cable installation. Since 1977 we are manufacturing rubber caps according to drawing, samples of customers, Available Materials EPDM, Silicone, Polyurethane PU, Natural, Viton, NBR, Butyl.